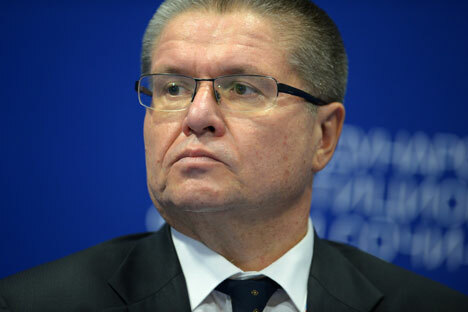 Russian Economic Development Minister Alexei Ulyukayev. Expanded list of U.S. sanctions included Gazprom subsidiaries. Russia will not expand food embargo against the United States in response to the additional sanctions against a number of Russian companies and citizens, Economic Development Minister Alexei Ulyukayev told journalists on Sept. 3. "I think there is no need for this. I would say, this is a convulsive mechanical act on the part of the US. It could mean anything," said Ulyukayev. "It could be timed to coincide with the forum, could be an attempt to pressure Japan. I do not think it would bring any economic dividends to those who organized it," he said. According to Ulyukayev, the United States imposed sanctions against Russian companies and citizens on a "schedule." "It feels like they have a schedule — sanctions in Aug., in Dec., some sanctions in Feb. They do it according to the schedule, well God bless them. We have things to do besides this," the minister said. Sberbank CEO Herman Gref said on Sept. 2 that new sanctions by the U.S. will not have a significant impact on the Russian economy. "I do not think that this will have a significant influence — not economic but rather political. I find it hard to predict when the sanctions will be lifted," he said. Russian Deputy Prime Minister Arkady Dvorkovich said earlier that another round of US sanctions against Russia will not have any serious effect on Russia’s economy and business. He added that Russia is already accustomed to the fact that "the sanctions exist and such changes have little meaning." The US government expanded the list of Russian individuals and legal entities subject to unilateral American economic sanctions on Sept. 1. The list has been supplemented with 17 individuals and 19 companies. The list of those subject to sectoral sanctions has in particular been expanded to include a number of Russian energy giant Gazprom subsidiaries. The sanctions were also slapped on the companies linked to the construction of the Kerch Strait Bridge.